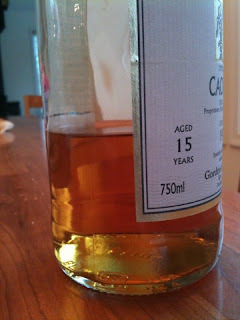 The Coopered Tot: Caol Ila 15 Gordon & MacPhail 1981-1997: Iodine, honey, sea salt, flowers and smoke. 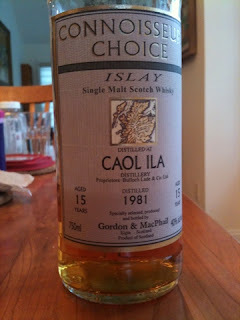 Caol Ila 15 Gordon & MacPhail 1981-1997: Iodine, honey, sea salt, flowers and smoke. Caol Ila was one of the less well known Islay malts back in the late 90s when I bought this bottle. The distillery's own label wasn't distributed in NY at the time. 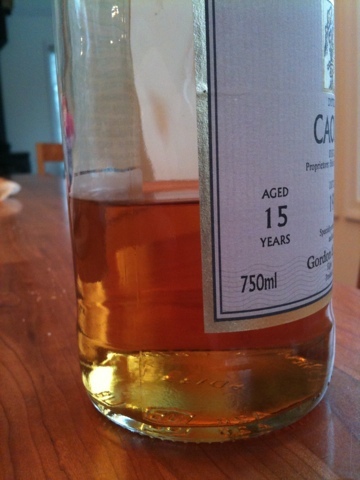 Caol Ila has since had a major Renaissance. This 15 year old bottle of 15 year old whiskey is a look back. I find little has changed. Semi sweet entry with immediate iodine brine, pepper and damp wood. After significant air there's a honey sherry glory lurking in the entry but it forms a backdrop for the sea flavors that take center stage. The midpalate expansion is abuzz with pepper, fire smoke, floral sherry honey and a fairly rich viscous mouth feel. Finish is fairly long with fine restrained peat smoke, old dry wood, dank meadow, and distant floral and incense perfume. The finale ends on a slightly bitter and medicinal note that is fitting. This is a pure expression of the spirit of Islay, but a fairly restrained and deceptively complex one. Lovely, if not a real boomer. How does it compare to the new Caol Ila 12? The new one is sweeter and more sunny. It also has a cleaner and more direct peat note. However it's less complex and interesting. Bottom line, however, the new distillery product simply tastes a little bit better in my book. Maybe that's just its youth. It's a happy debate; both are very nice to drink. Just saw this bottle in a shop for around $150 - and was thinking about buying it as a birthday present for a friend born in '81. Is that a decent price for such a whisky? Older Caol Ilas are rare and popular. You'll pay a bit extra for any of of the Islay whiskies of that age (as opposed to a Spey or Highland). But these days $150 is pretty par for the course for any 1981.. Thanks for the answer Joshua. Great blog!